An ingenious zoom lens that fits your iPhone 4. Get up close and personal with this amazing iPhone zoom lens. Simply click it on to your existing iPhone camera and get picture detail you never thought possible. Mobile phone photography is improving all the time and now rivals or even exceeds the quality of many small digital cameras. But one thing that mobile phone cameras can fall down on is the level of optical zoom available. This clever add-on is a simple solution to the problem giving your iPhone camera an 8x optical zoom ability. Now you can get pictures of small or distant objects while retaining great picture quality. Simply attach the adjustable universal bracket to your iPhone, and slot in the lens whenever you want to use it to take close-up pictures. The bracket also has an adaptor on its base, allowing you to attach it to a tripod or monopod stand for extra stability. 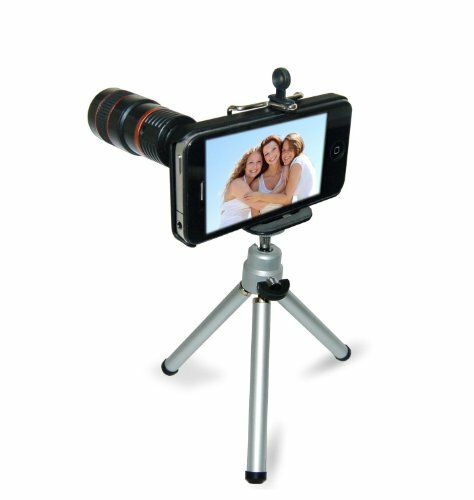 The iPhone Zoom Lens also includes a tripod to ensure stability while shooting, a case and strap for protection and easy mobility and high quality lenses. It is small enough to carry in your pocket, and makes your iPhone 4 more functional than ever before. Mobile zoom lens & tripod for iPhone 4 - 8X magnification. Get up close and personal with this amazing iPhone zoom lens. Simply click it on to your existing iPhone4 camera and get picture detail you never thought possible. Includes: Focal lens, iPhone housing, tripod & clamp, carry case, lens cleaner.